If you are planning to go to Bali, don’t forget to add Ubud in your itineraries. Ubud Gianyar is the central of cultural attractions and places in Bali. After visiting Pura Tirta Empul and the amazing view rice field with subak irrigation system Tegalalang Rice Terrace, I continued my trip to the unique cave, called Elephant Cave. 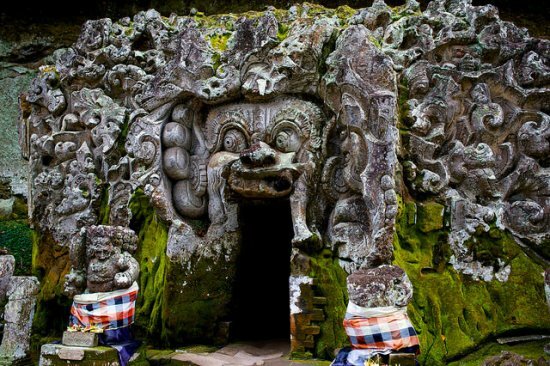 Goa Gajah or Elephant Cave Ubud is located west of the village Bedulu, Blahbatuh, Gianyar, Bali. Since 1995, this place is tentatively recognized in UNESCO World Heritage Site, with its culture richness. The best thing we can see here is the stone carvings and the big statue of elephant Ganesha, the god of knowledge. For centuries, Buddhist monks used this cave as the place to pray, but nowadays, we can visit this place freely as popular tourist attractions. What can we do in Elephant Cave? 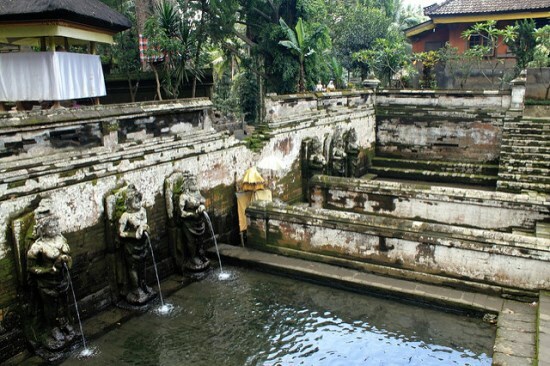 Goa Gajah word comes from the word “Lwa Gajah”. Word “Lwa” means river and “Gajah” means elephant (Ganesha, which is the god of knowledge). On 1365, Mpu Prapanca (the famous writer of the book Negarakertagama), wrote about this place. A majestic temple near the river in Bali, he wrote. Goa Gajah is surrounded by a small forest with lush green trees. It covers the temple from the main road. According to local people (I asked them during my visit here), the trees are hundreds of years old and known as the sacred forest. That’s why people don’t want to cut it. After walking down the stairs and pass the forest, we will find the fountain statue and the cave main entrance. The main entrance is very unique, only one person can go through in time because it was quite small and fit to one body only. We can see the carved stones showed about two dwarves. Going inside the cave, we will face the T-intersection. Left is the hall for religion ceremony and the place for personal meditation. And the right to another hall, with the big statue of Ganesha (elephant) and 3 lingga (inscription). Just behind the cave, we can see the natural spring water, called Petirtaan. In the center of the spring, there are seven statues Widyadara-Widyadari who holding potteries. “Why seven?,” I asked the local people that came with me. Seven statues symbolized the seven holy rivers in India, the birthplace of Hinduism and Buddhism, while this cave was made for. From the parking area towards Goa Gajah Ubud, travelers should be down the stairs to Goa Gajah Ubud. It is surrounded by lush green trees, so it was very cool and beautiful.